The weather just is incredible here in the Midwest. We are seeing temps in the 50's, for January, this is unheard of. I wore shorts and flip flops to the store again! I know it won't last but I will certainly enjoy it while I can for sure. So many of you who have been with me since the beginning, have learned a few of my dark secrets. Ok, I don't know how "dark" they are, rather just some of my likes and dislikes as far as food and life. One of my major food dislikes is onions. I hate onions like my husband hates cleaning his dang trash out of the car and....oh wait, sorry, got off topic. Let me compose myself. I hate onions like crazy. Raw onions have to be the be worst consumable food right behind beans. I avoid them at all costs, until, years ago now, I discovered, "caramelized onions" and French Onion Soup! I love it! How can that be you ask? Because for all of you fellow onion haters, when you hear someone say, caramelized onions are sweet, they are not lying. They get brown, and the sugars come out, and caramelized and the goodness is nothing like raw onions. It is a whole new world people!! So, my fellow haters of the onion, I challenge you to give this a try. 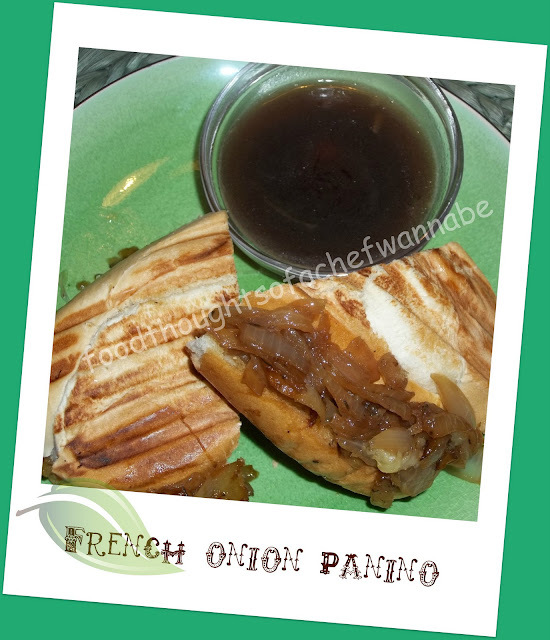 I decided french onion soup would make a great sandwich so I came up with this. Give it a try and let me know what you think!! This recipe is written to serve 4. In a high sided skillet, add in butter, olive oil, and onions. Stir, coating all the onions in fat if possible. Add in thyme and salt and pepper to taste. You need to add salt so that the onions will sweat and let off their juice. You smell when you sweat, well so do they, that is how you will know you are on your way to caramelizing! Let cook on medium heat stirring often for approx 20-25 minutes. Halfway throw cooking add 1/4 cup beef stock and stir. You will know they are ready when they look like this. Then remove from heat. Use a panini press if you have one. If you do not have one, take a brick and wrap it completely several times in foil. Use a clean skillet and melt 1 tsp butter in it. Use the brick to "press" your sandwich. Assemble it with 2 pieces of cheese, one on each side of bread with onions in the middle. Make sure to serve Au jus and dip and eat! It is a delicious thing! Is it a french dip or is it not? You decide if it is your new meatless french dip! Remember when using salt that your beef stock or consomme might be salty, so don't over salt your onions! This is a great change up from your hum drum ordinary grilled cheese! Go ahead, give it a go and see what you think. As for me, I say MMMMMMMMmmm!!! Crackin me up girlfriend............sounds really yummy tho.........will give it a try. looks awesome ! totally can't wait to try it! the sweaty onions comment cracked me up! Well.......the do stink when they get hot right?? So do people! LOL Sorry, its my abnormal way of thinking! The sandwhich is amazing, I thought more people might think so, maybe not such a hit for some! !